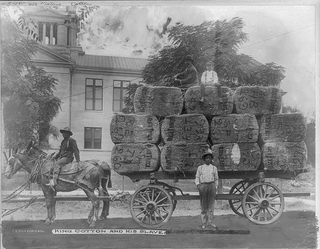 “King Cotton and his slaves, Greenwood, Miss.” Photograph shows three African-American men and one boy posed with a horse-drawn wagon loaded with bales of cotton in front of the Leflore County, Miss., courthouse. I have learned that my great-grandfather Peyton Locke (1840-1889) and his eldest son, Ben Locke, were both killed in Mississippi in the Leflore County Massacre. The September 1889 massacre, in which dozens of black people were killed for organizing a Colored Farmers Alliance, was not a part of my family lore. In fact, I only learned of the massacre in 2013 by accident, while searching for information on my ancestors. Among the sources I found useful for learning the history were “National Control of Elections” in The Forum, Volume 9 (1880), “A Brief History of the Colored Farmer’s Alliance Through 1891,” Indigenous People of Africa and America (June 1999), and “The Leflore County Massacre and the Demise of the Colored Farmers’ Alliance,” by William F. Holmes in Phylon, Vol. 34, No. 3 (1973). There’s no family lore about the massacre, although my great-uncle Dudley Locke (1888-1983) reported that he was told his father, Peyton, died when he was 1 year old. I found a newspaper article from the Sept. 6, 1889, New Haven Register identifying my great-grandfather and great-uncle by name as victims of the massacre. Census records for 1880 put Peyton Locke as being born in North Carolina around 1840, based on his age in 1880. The 1880 census reports that both of Peyton’s parents were born in North Carolina. You’ve done an impressive amount of research on this chapter in your family’s history, so after you contacted us, we were not surprised to learn that you are an academic: a distinguished professor emeritus at North Carolina State University and retired director of diversity and multiculturalism at the University of North Carolina at Asheville. How Did Your Ancestors Perish? One of many sad chapters in the history of American race relations, the Leflore County Massacre was a bloody check to African-American progress. Eighty-five percent of the county’s population was black in 1889, writes Steven J. Niven in the ”Oliver Cromwell” entry of the African American National Biography (of which Professor Gates is co-editor with Evelyn Brooks Higginbotham). This was cotton-growing country, and both blacks and whites were being hard-hit by falling cotton prices, as well as a succession of bad-weather events. To survive, each organized into its own racially homogeneous organizations. Led by Cromwell, who had previously organized blacks into a militia group in the town of Clinton, Miss., the Colored Farmers Alliance was considered to be a threat by local whites. The National Guard was sent in, and reports later surfaced that they handed over CFA members to local whites. As few as six and as many as 100 black people perished, and the back of the local CFA was broken. Though there’s barely a bright side to this story, Cromwell apparently escaped, and the CFA continued to grow in other parts of the South. Greenwood, Miss., Sept. 6. — Twenty-two negroes, and possibly more, who were working on a cotton plantation Monday morning, now rest beneath the sod in Leflore county, riddles by bullets. Ben Locke and Warren Beckworth. They were killed for resisting arrest. One was killed on Monday or Tuesday, and others Wednesday and Thursday. The negroes are in a frightful state of fear, and two have gone crazy over the excitement. They have threatened to burn every house in Leflore county, and all buildings are being closely guarded. More than 2000 laborers have quit the fields, and the cotton and corn needs gathering badly. Who Else Was in the Household in Which Peyton Locke Had Been Enslaved? You have already identified Peyton Locke’s former slave owner, which helps in finding more information about Peyton Locke during slavery. We looked at U.S. census records and slave schedules for William H. Lock, as well as marriage records. We also cast our net for deeds, probate records and account records in William H. Lock’s name, as sources that might mention the enslaved Peyton Locke by name. The 1860 U.S. census, available (subscription required) at Ancestry.com, states that William H. Lock was living in Lowndes, Miss., and that he was born in North Carolina. This matches the information you provided us about William. According to the record, William’s wife was named Virginia, who was also born in North Carolina. Based on the ages of the children in the household, it appears that this was likely William’s second marriage, since his wife was only 26 years old and the eldest child was 15 years old. It may help you to note the names and ages of William’s children, as vital records for them may reveal more information about William H. Lock. We noted that all of the children in the household were born in Mississippi, meaning that William H. Lock had been in Mississippi since at least 1845. This is just five years after your Peyton Locke was born. We were also able to locate William H. Lock in the 1860 United States Federal Census Slave Schedules, via Ancestry.com, with a 20-year-old black man listed who could be your Peyton Locke. This seems to confirm your suspicions that William H. Lock was Peyton Locke’s former owner. Going back 10 years, we examined the 1850 United States Federal Census Slave Schedule record for William H. Locke (note the variant spelling) in Lowndes, Miss., available to search for free through FamilySearch, and discovered that he did not have a male close in age to Peyton in his household in 1850, suggesting that Peyton may have been brought to William H. Locke’s property between 1850 and 1860. This is good news for your search, since it increases the likelihood that a probate record or deed may exist during slavery that documents Peyton Locke’s transfer to William H. Locke’s estate. To confirm that we had located the correct William H. Locke/Lock in the 1850 Slave Schedules, we located him in the 1850 United States Federal Census (via Ancestry.com) to find that he was, in fact, residing in Lowndes, Miss. According to this record, he was born in Tennessee and was married to a woman named Martha. We know that this is the correct person based on the names and ages of his three youngest children, who also appeared in the 1860 census. It could be that his birthplace was recorded incorrectly, or it could provide another location in which to look for information about William H. Lock/Locke. Regardless of his birthplace, this record confirms our suspicions that he was married twice, providing two more people to research for information about Peyton Locke. How Did Peyton Locke Come Into William Lock’s Household? You’ll want to find out as much as you can about William H. Lock’s wives. Keep in mind that often slaves were left in wills to daughters, so it is possible that Peyton Locke was brought into William H. Lock’s household through one of his wives. Via FamilySearch we located a marriage index record for William H. Lock and Martha Thompson in Lowndes County, Miss., on Feb. 16, 1843, meaning that he was in Lowndes, Miss., by 1843. There is also a marriage index record for his marriage to Virginia A. Yelloweby (under the spelling “Locke”) on March 7, 1855. These records are consistent with the census records we located for William H. Lock. You could order the original marriage records to view on microfilm from the Family History Library and view it at your local Family History Center. The original records may contain more information about William H. Lock and his wives, Martha Thompson and Virginia A. Yelloweby. It is interesting that William H. Lock/Locke married Virginia A. Yelloweby in 1855 precisely in between the two slave-schedule census records. Perhaps Peyton entered the household because of this union and he was actually previously owned by the Yelloweby family. This scenario is particularly intriguing because we know based on census records that Virginia (Yelloweby) Locke was also from North Carolina. More research on the Yelloweby family in North Carolina may provide more clues. You could search for probate records pertaining to the Lock/Locke, Yelloweby and Thompson families in Halifax County, N.C. (via FamilySearch), to see if any probate records for the family mention Peyton. These records do not have a search option, but you can browse the records by county and record type. If one of the parents of William or either of his wives died between 1850 and 1860, a probate record for them may mention Peyton’s transfer to William H. Lock’s household. What Other Sources Might Cast Light on Peyton Locke’s Early Life? Aside from searching for information on the former slave owners, you may also benefit from searching for Peyton Locke in the records of the Freedmen’s Bureau, which aided the formerly enslaved after the Civil War. They may include more details about his early life. Some Freedman’s records for Lowndes County, Miss., are available on microfilm through the Family History Library. You may also want to examine Freedman’s Savings and Trust records. These records can often include information regarding place of birth, where an individual was raised, the names of family members (including parents), a person’s occupation and sometimes the name of their former owners. If Peyton applied for an account, you may be able to find him in these records. You could also examine the Slave Register and Owners Ledger for Lowndes County, Mississippi 1837-1846 via FamilySearch. The date range of this collection includes the year that Peyton Locke was born. The lists include the slave owner’s name, the name of the enslaved and the date the individual was brought into the state. If Peyton was transferred from North Carolina to Lowndes, Miss., as a young child, he may be included in these records. You could also see what other enslaved people William H. Lock brought into the state during this time since there is the potential that they could be relatives to your ancestor.